Caption: Atkinson Action Horses in action. 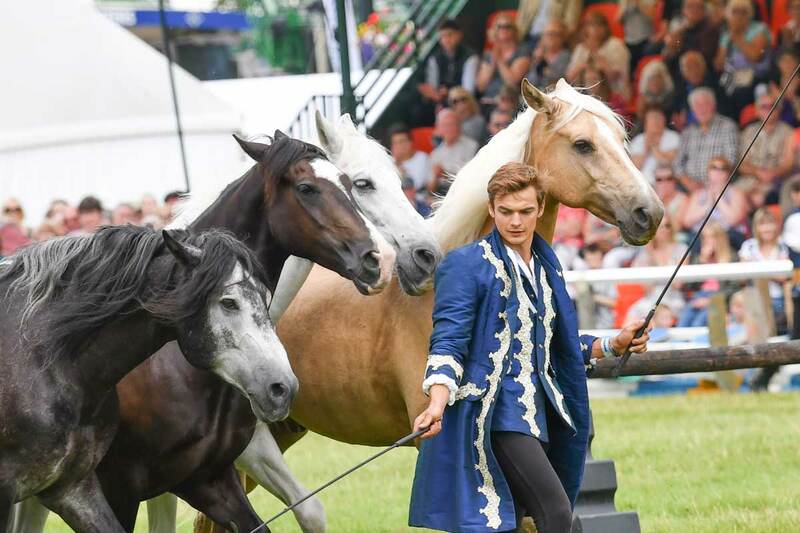 Equine stars from Atkinson Action Horses that have featured in film and on TV have been confirmed as 2018 Main Ring attraction at the New Forest Show on 24-26 July. Having spent 22 years training horses and riders for film and TV, with recent credits from Poldark, Victoria, Peaky Blinders and The Living and the Dead, Atkinson Action Horses are now bringing their equine stars to perform at the New Forest and Hampshire County Show on 24-26 July as the main ring attraction. Sponsored by Shorefield Holidays, they are a taking their fearless team of stunt riders and horses on a unique tour all around the UK. Visitors to the New Forest and Hampshire County Show at New Park, Brockenhurst, need to be prepared to put their hearts in their mouths as they watch the riders demonstrate astounding acrobatics. The show also includes a short but stunning section dedicated to the art of Liberty – displaying the seamless harmony between the horses and their on screen trainers. Get ready for an astounding display of tricks and stunts normally reserved for only TV and the Big Screen. All in front of your very eyes. Tricks/stunts include: Roman riding, drags, falls, pick ups, flips, horses rearing and lying down. Other main ring attractions will include the heavy horse musical drive, grand parade of livestock and hound parade. In addition the show has introduced a Kids Go Free promotion. Any child under 16 years of age will enter the show for free when accompanied by a paying adult or senior. Visit the New Forest Show website for early bird ticket prices (before 17 July).